Each Monday, this column turns a page in history to explore the discoveries, events and people that continue to affect the history being made today. 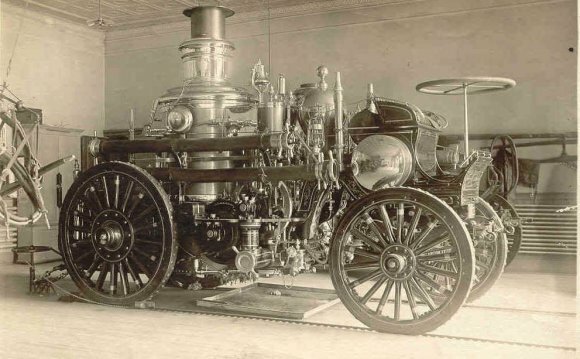 It is fitting that the first person to devise a working steam engine would be a man named Hero. Sixteen hundred years after the ancient Greek scientist first made mention of the untapped power of steam, the technology would become the hero and the engine that drove the Industrial Revolution. When it was refined by 18th century scientists such as James Watt, steam power overcame the limitations of using relatively weak men or tired horses to do grunt work and sped factories along at a pace never before seen. The Middle Ages aren't usually associated with industry, but societies across Europe, the Middle East, and parts of Asia and Africa did indeed have factories and manufacturing plants, albeit slow-working ones. Textile production, for example, was a bustling trade, but had to deal with the geographic separation of the grazing sheep that provided the wool, the water-powered mills built along mountain streams and the cities where the cloth was purchased at market. The packhorses or mules that transported goods between them were expensive and slowed down by the weight of their load. Horses were also used to lug buckets of water out of flooded mines, but needed frequent breaks and lots of care to keep them in good shape. Yet beasts of burden may have remained the mechanism of choice had it not been for the 17th-century British glassmakers that required enormous amounts of coal to keep their hot furnaces burning. The horse-pulley system used to drain coal mines proved inadequately slow in keeping up with the glassmakers' need for the fossil fuel, and there were lucrative rewards for anyone who could develop a better way to drain the mines. Scientists began tinkering seriously with steam in the early 1600s and, like most inventions of the day, it was a team effort that ultimately led to the first working steam engine. In 1698, British inventor Thomas Savery patented a steam-powered pump, which he described as an "engine to raise water by fire." Savery's very basic engine relied on steam to create a vacuum and pull water upwards through a pipe — a theory that had been around for several centuries but never successfully applied. The technology was improved with pistons and cylinders by Thomas Newcomen, a blacksmith, and again by Watt in the mid-18th century. By that time, the speedy engine's reputation was gaining steam well beyond mining circles, moving indoors to other areas of industry from metalworking to textiles, where it was adapted to the rotating wheel system common in European mills. A savvy businessman, Watt marketed his machine by calculating the number of horses his engine would replace, coining the term "horsepower" in the process. The simultaneous perfection of the steam engine and the beginning of the Industrial Revolution is a chicken and egg scenario that historians have long debated. The world was becoming an industrialized place before the advent of steam power, but would never have progressed so quickly without it, they argue. Factories that still relied on wind or water power to drive their machines during the Industrial Revolution were confined to certain locales; steam meant that factories could be built anywhere, not just along fast-flowing rivers. Those factories benefited from one of the world's greatest partnerships — that of Watt and Matthew Boulton, a British manufacturer. Together, they tailored Watt's steam engine to any company that could use it, amassing great fortunes for themselves but also sharing research over vast distances. Transportation was one of those important beneficiaries. By the early 1800s, high-pressure steam engines had become compact enough to move beyond the factory, prompting the first steam-powered locomotive to hit the rails in Britain in 1804. For the first time in history, goods were transported over land by something other than the muscle of man or animal.